Clicktodiscount.com > Hive.com Review – The productivity stack for 2019? Hive is a cloud-based project administration solution designed for teams of all sizes who need to share files, chat and automate task management. You should read my Hive.com review to find out how this tool works and why it is so popular. Nowadays with so many workplace tools available, it can be difficult to find the best productivity apps that meet your needs. Hive could be the suitable app for you. It contains workflow templates, group messaging, multiple task views and over 100 app integrations. 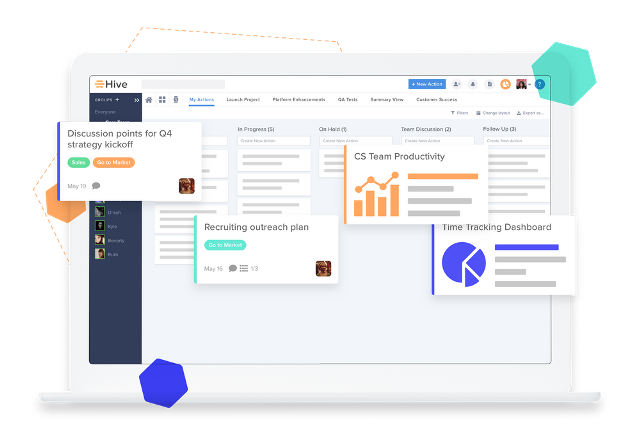 Hive lets users create and organize tasks for themselves and their teammates, with task deadlines, attachments and labels. Files stored in Box, Dropbox and Google Drive can be accessed in a single page, and users can attach files to actions or drag and drop them into messages to share them with team members. Let’s take a look at my Hive.com review to understand more about its features, pricing and some pros and cons. Flexible project: Your team is able to plan their projects in the way they work best. Arrange your projects in a gantt chart, kanban board, table, or calendar, and easily switch between each layout. Updates are reflected across all project views so the whole team is notified no matter what option they use. Multiple views: With multiple views feature, you can see each project by current status, team member, or assigned labels. You can also use summary views to integrate several projects and view the big picture across your company. Action templates: You are able to plan and repeat tasks easily using action templates. You can also set up all required steps in an action template that can be easily reused to assign tasks to the right people, on the right timeline. Action cards: You can easily approach all the information that you need to complete a task by assigning team members, attaching files, creating sub actions, and setting dependencies directly in the action card. You can comment and mention team members, making sure that everyone can clearly track the progress of each action. Action list: Your personal to-do list can be created right in Hive, arranging a list of everything you’ve been assigned to across your projects. View what’s on your plate each day and understand when your items are due. Forms: Use Hive forms to gather the important information you need to work on a project. You don’t have to waste time with back-and-forth emails. Forms can also be sent outside your organization, allowing you to collect information from clients, customers, and more. Chat: Good communication is the key to the success of any team. Hive messaging lets you have conversations with groups or individuals directly in Hive. With their integrations, you can also connect to Slack or start a video conference using Zoom. File sharing: Organize your work by connecting your Google Drive, Dropbox, One Drive, or Box account directly to Hive so you can easily view and share your files. External users: From clients to contractors, you may work closely with individuals outside of your organization. With external users, you can invite these partners to collaborate on a single project in Hive. Hive analytics: By leveraging existing data and machine learning to figure out how your team works, Hive Analytics interactive dashboards provide actionable insights on your team’s productivity. This helps you to figure out where problems are, and what changes could improve productivity and utilization. Predictive alerts: With real-time notifications controlled by machine learning, you’ll be instantly notified to anomalies in your team’s productivity. This make sure that you’ll never be surprised by late projects or an overbooked team. Time tracking and resourcing: You can control your team’s utilization across specific projects or clients directly in Hive. Measure and track time spent on projects, accurately allocate resources, and proactively identify opportunities and blockers. Apps: No matter where you work, Hive has an app for you. Download desktop apps for Mac and Windows and mobile apps for iOS and Android, making it easy to approach your workspace everywhere. Integrations: Easily accommodate with other tools including Google Drive, Dropbox, Slack, Zoom, One Drive, Box, and more. With the partnership with Zapier, Hive integrates directly with 1,000+ tools. Import: Hive helps you to import tasks easily from your previous tool. With import options from Asana, Trello, Basecamp, and more, you won’t need to start from scratch. Hive provides you with two packages to choose, depending on what you need. 3.1 Professional plan with $12/user, per month. Here are some advantages and disadvantages that you might need to find out in this Hive.com review. – Hive is customizable. You can view the project in many different ways. – You can see all of your projects all together with summary view. – There are a lot of useful features that really meets my needs. – Hive is comparatively slower than its competitors. – It does not have variety of scripting languages. Don’t worry if you can’t decide which plans to choose. Because Hive offers you 14-day free trial for both plans, with no payment details required. In conclusion, I think Hive.com is worth a try for people who want to control their files, chat and automate task management. Hive helps you to improve employee engagement. You can start your 14-day free trial first to decide whether to use this or not.